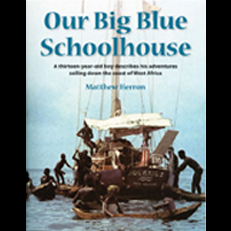 Our Big Blue Schoolhouse is the account of an incredible sea journey, told from the perspective of thirteen-year-old, Matthew Herron. The Herron family has been quite the inspiration for those involved in both traditional and non-traditional schooling. As a family of four, parents Matt and Jeannine understood the stresses of raising and educating children in modern-day America, leading them to plan a family trip that would teach, excite and culturally enrich them forever. The Herron’s set off in ( ) for an 18-month adventure, sailing from New Orleans to Maurentia, West Africa; leaving behind their “Little Red Schoolhouse” for a “Big Blue Schoolhouse.” Matthew’s parents instructed him to keep a log (journal) while traveling, making an account of everything that was seen, heard, and felt during their voyage. Those entries then made their way into this book. Reading Matthew’s story, a once-undiscovered (by the outside world) West African world comes to life through the eyes of a child. Matthew talks about everything from learning how to sail the 31-foot boat he called home, to how he was able to engage with children of other cultures. The Herron Family also faced hardship in the form of bad weather and thievery while on their trip, which Matthew discusses, teaching very important, yet simple, life lessons. A class of 11-year-old students from Rochester, New York (who were keeping track of the family’s sailing progress on their classroom map), contacted Matthew via letters full of questions each month. The Answers to many of those questions are included in the book and provide an even deeper connection with the reader, as similar questions are bound to be asked by any young reader. Perhaps one of the greatest features of this book is the incredible photographs that fill its pages. Father, Matt Herron, put his photo-journalism skills to work, capturing vivid photographs that pair perfectly with his son’s words. Although most families will not have an opportunity to sail coast to coast, a day trip to a state park, hiking trail, or historical monument will provide a wide perspective that is crucial for engaged learning in the 21st century. Our Big Blue Schoolhouse was written to remind families and children that the world is our greatest teacher, while also being a great resource for families looking for unique, real-world, teaching opportunities. True problem-solving and social skills cannot be grasped fully in the traditional classroom; let this book offer you a view into other options for life and learning. Additional resource: The Voyage of Aquarius provides another detailed account of this sea journey, told from the point of view of all four Herron’s. S.H.